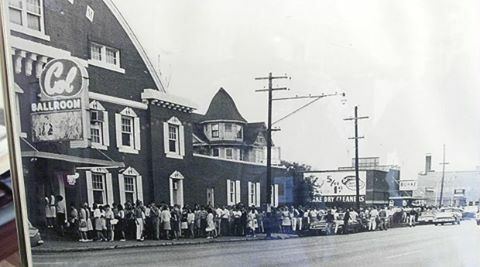 I do not remember the lines being quite as long to get in as it shows in this photo, but I do remember spending many evenings watching bands at the Col Ballroom in Downtown Davenport, Iowa. It was where Jon, Ken and I saw Jimi Hendrix play, although we were not all in the same band at that time. In fact, Silver Laughter was not born yet. The layout, as I remember, was a huge dance floor in the middle where there was standing room only, and then tables and chairs around the perimeter. Usually we would stand near the front to steal chords and lyrics from our favorite bands! I am pretty sure I never played on that stage, not even with The Contents Are:, but I think the early Silver Laughter band did.